One of our primary academies, Stanley Grove, is leading a multi-language poetry performance this term, involving over 20 other schools across Manchester. ‘Manchester’s Multi-Language Mushaira’ is linked with Manchester Library Service, Manchester Metropolitan University, the University of Manchester and the Whitworth Art Gallery – and follows the theme of food. A mushaira is a poetry performance in South-East Asian languages. They are traditionally lively and interactive – ours will involve four professional poets and two professional artists as well as the schoolchildren, who are all writing poetry about their favourite foods and food culture, in whichever language they choose. 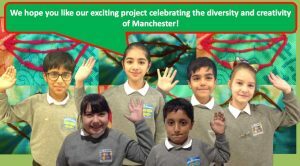 There are over 200 languages spoken in Manchester, so this should be a fantastically diverse poetry project, which culminates on 21st February – UNESCO’s International Mother Language Day – when poetry pods in the city centre locations will be uploading photographs of the poems and filming the pupils reading their poems. The professional poets will then perform some of these poems along with their own work to an audience sitting on giant picnic rugs, under a ‘poetry sky’ at Longsight Library – raising funds for local foodbanks in the process. What a way to celebrate the written word!